Camping families with young children are used to searching for new gear – as kids grow and explore, they’re constantly in need of gear that better fits their needs. Sleeping bags are no exception, and a good kid’s model is critical for helping your younger ones experience the joys of sleeping under the stars. Depending on your child’s age and the demands of your adventures, there are innumerable options to choose from. To help you decide, we’ve compiled and reviewed a selection of the best kid’s sleeping bags. We’ve even simplified the process by identifying our top pick and our best value pick. The Black Wolf Star 300 Kid’s Bag takes the gold in this review with its superb combination of size, warmth and unique features. Budget-conscious campers, on the other hand, will particularly enjoy our best value pick, the Wanderer Kids MiniFlame Hooded Sleeping Bag for its simple, yet functional design. That being said, we’re sure you’ll enjoy any of these sleeping bags – we’re just here to help you find the one that’s perfect for your child. Price: Let’s face it – kids grow, and they’ll eventually outgrow nearly everything you get for them. If budget is a concern for your family, you definitely want to keep an eye out for prices on these sleeping bags, especially if your child will be too big for it in a few years. 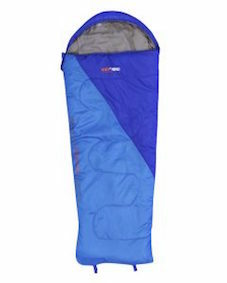 Luckily, our list contains a good selection of sleeping bags, which will fit any budget. Size: Since kids grow so quickly, it’s important to keep sleeping bag length in mind. 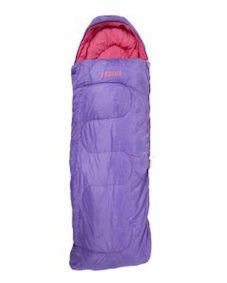 You don’t want to buy shiny new sleeping bags for your little ones just to find that they don’t fit! While some sleeping bags are sold in only one size, others come in a variety of lengths, so you can find the bag that’s right for your child. Temperature rating: Depending on your family’s needs and adventures, you might consider getting a warmer sleeping bag for your child to snuggle up in. If you’re looking only for a warm weather bag, then you can opt for a higher temperature rating. Zippers: The number and quality of zippers on your child’s sleeping bag can make a big difference. Having two zippers can be helpful for transforming a sleeping bag into a quilt on warmer nights. Even more important is the anti-snag zipper, which can make things easier for younger children when they get into bed at night. Our top pick in this review, the Black Wolf Star 300 Kid’s Bag has all of the features you expect from a child’s sleeping bag at a very reasonable price. Its large size makes it perfect for young children and pre-teens alike. Additionally, it's warm rating (-1°C) means your child can use it year-round without worry. Perhaps one of the most unique features of the Star 300 is its glow-in-the-dark zipper, which will make it easy for even the youngest of children to get in and out of bed at night. A cord for hanging up and airing out the bag and an included compression stuff sack make transport and storage of the Star 300 a breeze, too. Avid camping families will love the Wolf Star 300 because it’s both large enough and warm enough for children to use year after year. Its well-thought-out design will make bedtime simple without emptying your wallet. Another great option from Black Wolf, the Tuff All-Season Canvas Sleeping Bag is certainly made to last. 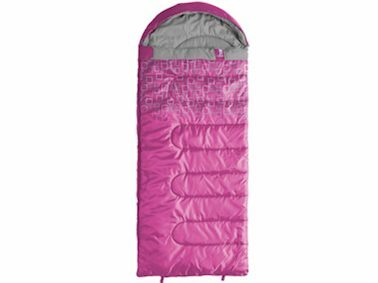 The only canvas shell sleeping bag in this review, the Tuff is perfect for families and children who require a lot from their gear. With three different sizes and a super warm -5°C rating, this bag will keep your kids warm for years to come. The bag even has a ‘summer’ mode with a Synsilk lining and light cover that will keep kids cool and comfortable in the summer heat. The Tuff’s fantastic canvas shell is even water resistant and it closes up with one anti-snag zipper. An internal item pocket and a hanging loop round out the list of features on this great sleeping bag. Our biggest concern with this bag: the price. The Tuff doesn’t come cheap, but you’re willing to splurge, you can rest assured that this bag is durable enough for your family’s adventures. The simple, classic design of the Wanderer Kid’s MiniFlame Hooded Sleeping Bag is ideal for families who want a functional bag without the high price tag. This well-designed bag is this review’s value pick. The MiniFlame comes with a solid 0°C warmth rating and a soft-to-touch, yet durable polyester shell. The interior brushed polyester lining and the cosy hood make it a comfortable bag to bundle up in on cool nights. The one high-quality zipper on this bag comes with anti-snag protection and will make it possible for your child to get in and out with ease. The bag even comes with its own stuff sack, so transport and storage will be simple and convenient. The bag’s smaller size (175cm length) make it ideal for younger children, but less suitable for pre-teens. 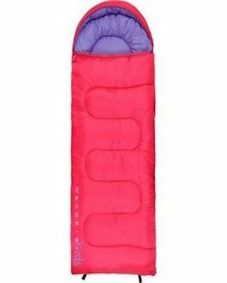 A great sleeping bag at a great price, you can’t go wrong with the Wanderer Kid’s MiniFlame. The bag’s polyester shell is comfortable, yet durable and the cotton lining feels soft against your skin. The Roman Junior comes complete with a hanging loop, so you can air it out and store it after your family’s adventures. We’d recommend this bag for smaller children, as its 175cm length isn’t suitable for very tall children. Whether you’re off on a month-long adventure or just a weekend outing, the Roman Junior 400 is a great sleeping bag for outdoor children. The Caribee Moonshine is the perfect companion for your children’s warm weather ventures. The bag’s two anti-snag zips will make it super easy for the little ones to get in and out of the bag. If that wasn’t good enough, those two zippers can be used to zip up with another bag to make a fun double sleeping bag for sleepovers with friends. A useful drawcord hood will keep your child warmer and comfortable on cool nights, though the bag’s 10°C rating means it’s best for warm excursions. Like other bags in this review, the 175cm length makes the Caribee best for the younger children in your family. The Caribee Moonshine is a high performing, comfortable sleeping bag at a great price. 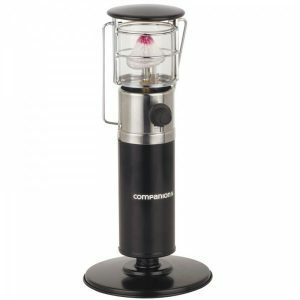 It will be the perfect addition to your family’s camping set-up and will make any young camper happy.